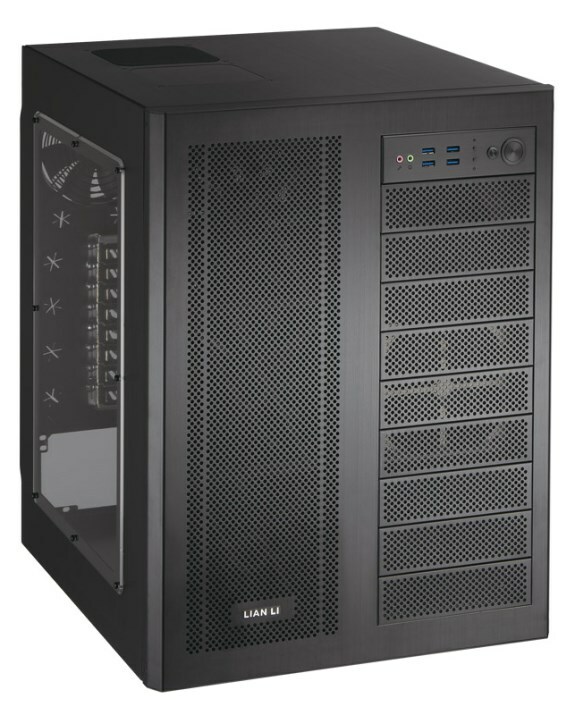 Lian Li has no trouble cranking out a couple of new, expensive cases every quarter. Today the company informs us about the PC-D600, a new aluminum chassis with a double wide body with two compartments. 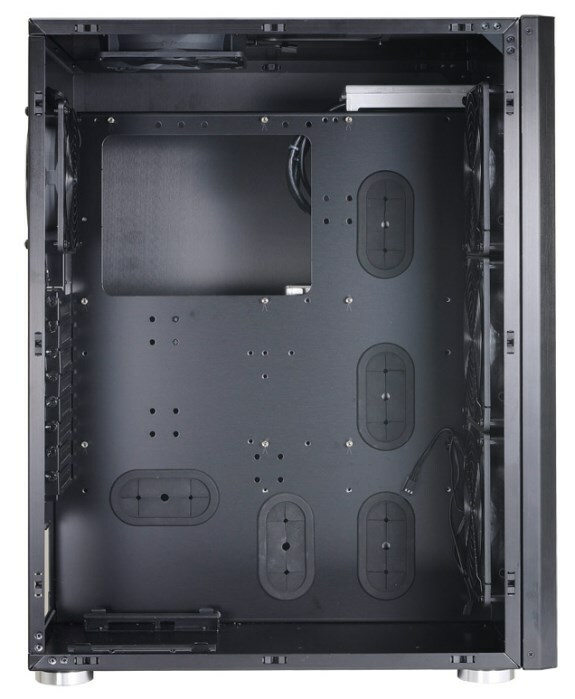 The case measures 382mm x 525mm x 415mm (W x H x D), it weighs 9.2kg and supports a Micro-ATX, ATX or EATX motherboard. Cooling is provided by up to six fans (3x 120mm, 3x 140mm) and there's room for radiators of up to 420mm. Other features include a whopping ten 5.25" drive bays, six 3.5" HDD bays, six 2.5" SSD bays, and eight PCI expansion slots. You can mount graphics cards with a length of up to 330mm, PSUs as long as 330mm and CPU coolers with a maximum height of 180mm. A front I/O panel provides four USB 3.0 ports as well as HD audio. The PC-D600 will start shipping on October 20th for $349. Lian-Li Industrial Co. Ltd today releases the PC-D600 double wide brushed aluminum chassis that was previously announced at COMPUTEX 2013. Supporting EATX, ATX and Micro-ATX motherboards, the PC-D600 with 2mm thick aluminum panels has a two compartment design, supports water cooling setups, and has numerous tool-less features to give absolute freedom to enthusiasts and modders to build a high end system. Separating the internal components into two compartments, the PC-D600 allows DIY enthusiasts to show off high end and intricate setups through the side panel window, while giving plenty of room for the wires and less eye-catching components on the other side of the motherboard tray. Not only does the two compartment design allow enthusiasts to show off their builds, it also allows uninterrupted airflow across the heat generating components. With tons of room to work with, installing elaborate water cooling setups is simplified in the PC-D600. A 240mm radiator can be installed on the left side of the case over the motherboard. On the right side of the case 360mm/420mm radiators in push/pull are supported. Even with a radiator installed on the right side of the chassis, a large space above the motherboard tray allows the CPU cooler, cables, or radiator to be effortlessly moved between the compartments. The PC-D600 has many tool-less features allowing for simple setups and installations as well as easy breakdown for modability. This fully aluminum case features pop-off side panels and front bezel, tool-less mounting for hard drives as well as clip-in dust filters. The entire HDD rack on the right side of the case can be pulled out of the case with the removal of a couple of thumbscrews. The three HDD cages inside the HDD rack are also tool-lessly removable and have 120mm fans mounted to them. These cages can be set up so that the fans are either towards the front of the case or behind the cage. Clamps on the reverse side of the motherboard tray can be adjusted and positioned for optimal cable management setups. The PC-D600 does not restrict hardware capability. Graphics cards up to 330mm (12.9”) and CPU coolers up to 180mm (7.0”) are supported. Six 3.5” HDDs and two 2.5” drives can be tool-lessly mounted in the chassis. Additionally, PSUs of all sizes are supported. The front I/O panel includes four USB 3.0 ports and HD audio connections.